Why indoor growers are switching from traditional HPS/MH lights to LED grow lights? It is because they are safer and more energy efficient. LED grow lights have proven themselves to be an efficient choice when it comes to indoor plant lights. 300w LED grow lights are a very popular category in LED grow lights. They are usually perfect for indoor growers who grow in a 3×3 grow tent and often grow a small amount of plants. In this article, we have collected a list of some of the best 300w LED grow light reviews. Read on for their details and choose the 300w LED grow light that is right for you. Ever wonder how good a 300w LED grow light can be? The MarsHydro 300w is one of the most popular lights on our website and therefore needed to be included in this list. It is an affordable light for every indoor grower that has everything you need as a beginner. The energy efficiency can be figured out as it consumes only 132 watt. This energy efficiency is coupled with the coverage area of 2’x2’. It has a high PAR value, which means more light and better growth. Another good thing is its design with separate circuit boards and heat sink. This makes sure the light is one of the most safe 300w LED grow lights available. The design of the cooling fans work efficiently to keep the light and environment cool. This is exactly what you need as indoor grower. Control over your light and environment is essential to optimize your yields. Moreover, the full spectrum that is developed after 8 years of research provides exactly the right wavelengths. This triggers the photosynthesis process in all stages of the plant growth. This 300w LED grow light outperforms HPS and CMH in every possible way. MarsHydro is providing all these features with a warranty of 3 years. The noise level of 56Db and the epileds LED chips support the growth of the plant. Consequently, this makes it one of the best 300w LED grow lights. We think this is one of the best 300w LED grow lights if you’re a beginner. It is a good looking 300w LED grow light with full spectrum, quality build and a nice coverage area. Designed carefully as a high-quality product, the Viparspectra 300w is one of the favorites among growers. It has an optimal full range spectrum and keeps the balance of PAR/Lumen output. This keeps the growth process at a good pace. The important thing to consider while buying a LED grow light is its coverage area. 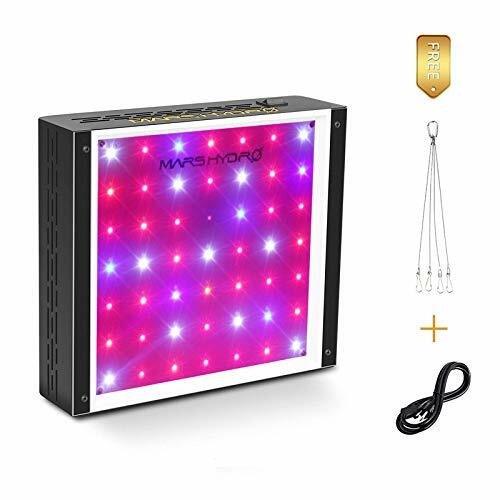 The Viparspectra 300w LED grow light is one of the best by giving 2×2 square feet vegetative coverage and 1.5×1.5 feet at a height of 18 inches. The light includes 30pcs of 5W Epiled/Bridgelux LEDs at an actual power draw of approximately 130w at 220V. The reflectors are fire resistant, which makes them very safe and the cooling system makes it safe as well. The light keeps a low temperature while operating. The advanced high-speed are very quiet and lower the temperature by 70%. The heat/fire resistant reflectors also make it worth every penny. The total 60 pieces of 5 watt epiled LEDs bring out the best intensity from them. As a result, it replaces a 250 w HPS/MH. 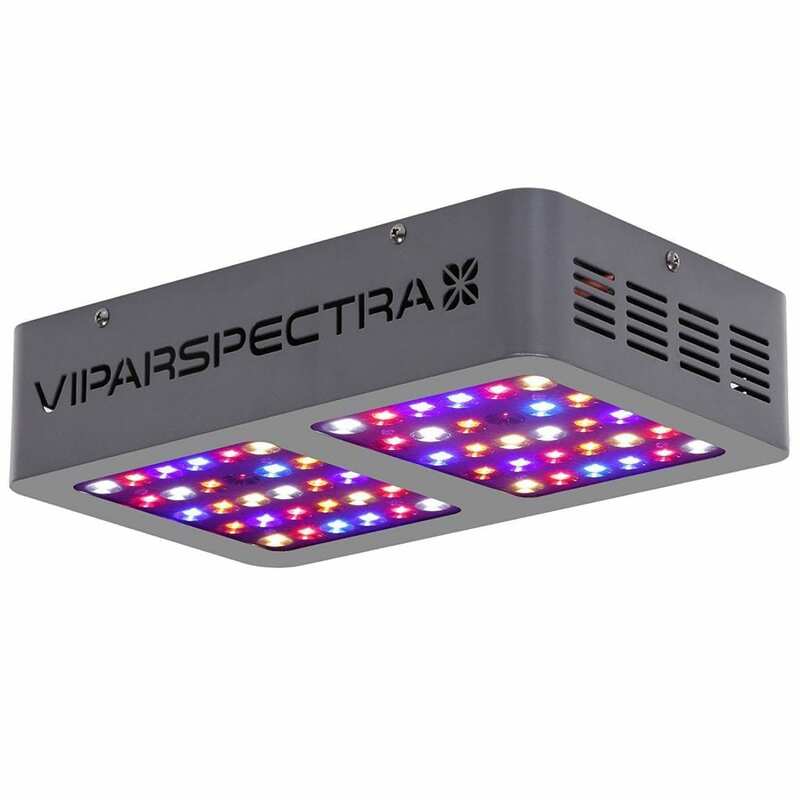 This Viparspectra V300 is one of the best 300w LED grow lights in its segment. It has an amazing spectrum, efficient cooling system, safe reflectors and a long warranty period. The high intensity and coverage area in this price range of 300w LED grow lights are biggest pros. With greater efficiency, advanced platinum is also one of the best 300w LED grow lights. It has a PAR output which is 2-3 times stronger than others. The 12-band spectrum including the UV and IR gives the best spectral output and best coverage in the market. Let’s talk a bit more about the Advanced Platinum LED 300w LED grow light. The coverage area is about 4.5×3.8 feet, which is much better than many other 300w LED grow lights. At a height of 18’’, it provides the best intensity and power. Apart from this, it has two high-speed fans, which keep this 300w LED grow light cool. It is a replacement of a 400w HPS while consuming only 180w per hour. Lastly, the lifespan of 100,000 hours makes it a long-lasting grow light. Even if it fails on you, this company provides a 5 year warranty. This guarantees the lifetime of your light. In this list, this is in our opinion the best 300w LED grow light. The advanced platinum is great to have for your vegetative and flowering growth. 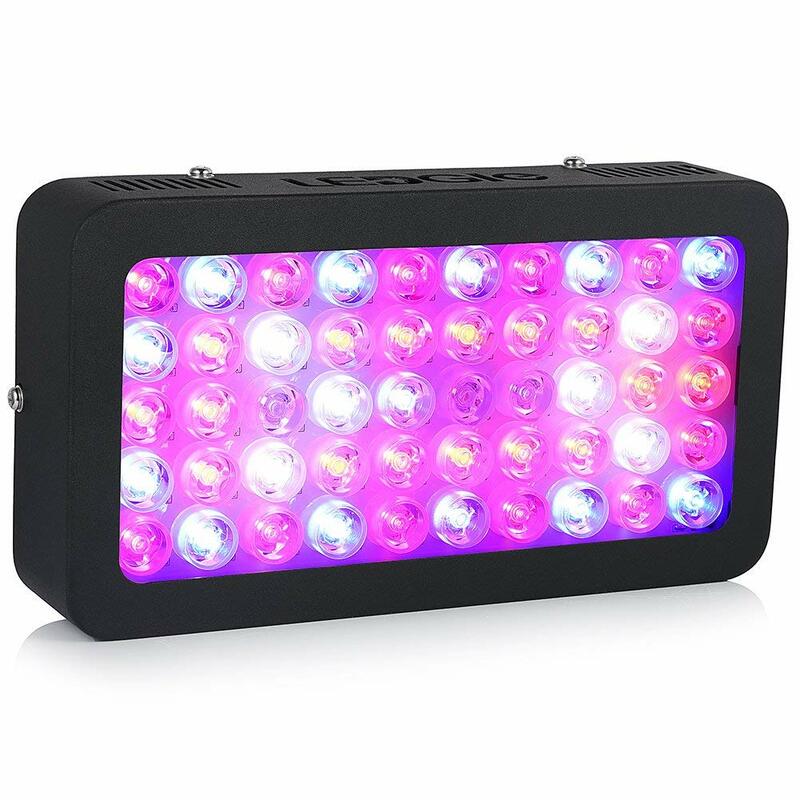 This is a must-have if you’re willing to spend a bit extra to get a good 300 watt LED grow light. Advanced Platinum P300 is the best mid-range 300w LED. 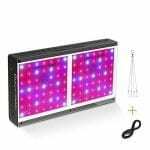 This is a super compact 300w LED grow light that is engineered to give the right light during the bloom and veg phases. The full spectrum range gives a good light for healthier growth. Its total of 50 LEDs of 6w each keeps the balance of the PAR output. Ledgle 300w has a coverage area of 6 to 10 square feet for veg and around 4 to 6 square feet for flowering. The availability of three different switches is specifically for the differentiated functionality. For better heat dissipation, this ledgle LED grow light comes with two cooling fans. These fans are noiseless and make the LEDs work for hours without heating up. Moreover, this LED grow light has holes in the aluminum panel. There is also an adjustable socket that makes it possible for you to adjust the height. In conclusion, the Ledgle 300w LED grow light is one of the cheapest 300w LED grow lights. There is no other light that is so cheap and still has all the essential features. Its brilliance is in its coverage, full spectrum, cool working, and especially price. MarsHydro is a quality brand when it comes to a 300w LED grow lights. We already covered its original 300w Led grow light and now review the Reflector 48. This 240w full spectrum LED light replaces a traditional 240w HPS/HID light. The LED grow light has an integrated circuit and is therefore very safe. This is a great and affordable light for every indoor grower. The coverage area is 2×2 feet, which is average when compared to other 300w lights. The MarsHydro Reflector series LED grow light gives a bright light due to its reflectors. The light is suitable for all growth stages. 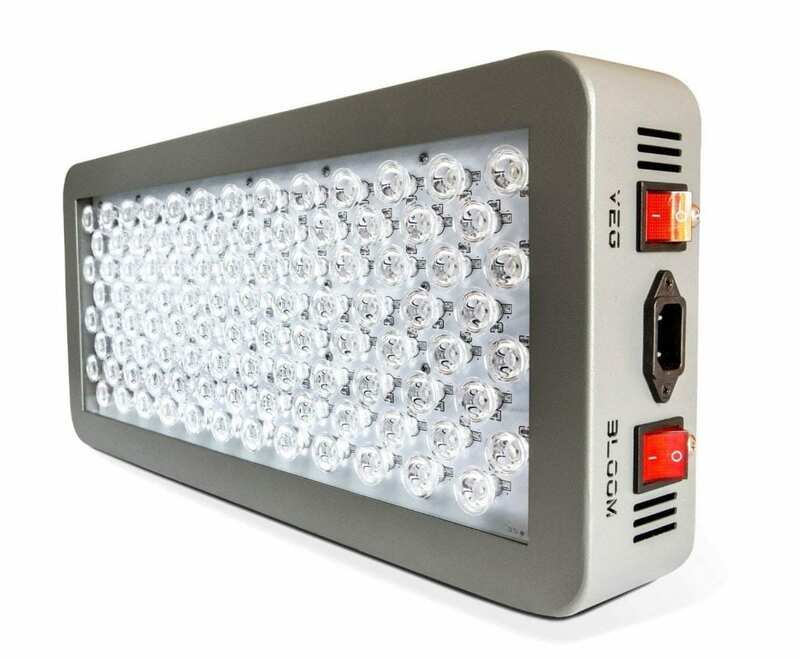 Always looking for a cool working LED grow light? This one has the heat dissipating fans, which work very efficient to keep the environment cool. Furthermore, they are silent and efficient. MarsHydro provides 3 years warranty for this light and also offers customer support. Especially the customer support is notable, since most companies lack a decent customer support. A great customer service combined with great features is what makes it one of the best LED grow light brands. This (almost) 300w LED grow light is efficient and popular in the market. Read the full review or make sure to check it on Amazon. ETL certified and one the best unknown 300w LED grow lights. 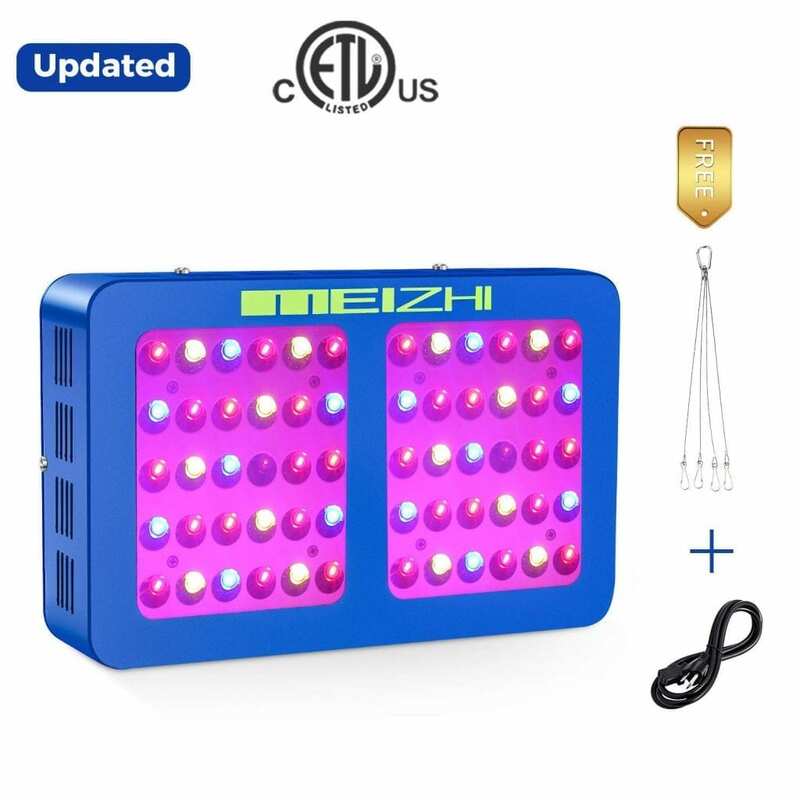 Meizhi is a safe choice when it comes to LED grow lights. If you want good coverage with a low power draw, this is the right choice for you. Its coverage area is 2×2 ft at a height of 18’’. This is not very big compared to other grow lights, but justifies its low price and low power draw of 139 watt. The cooling system of this 300w LED grow light works super quiet and effectively. Your environment will definitely stay controllable with this light. Moreover, the dense vents dissipate the heat very well. The reflector cup design satisfies your plant its need of light every day. The availability of the dual switches let you pick the right mode for the vegetable or flower phase. In addition, it consumes only 139w of power and saves up to 70% of energy. With a warranty of 3 years, this light can’t be missed in a collection of the best 300w LED grow lights. Meizhi LED grow light makes its name in the list of the best 300w LED grow light. With a sturdy structure and good light, this light has collected a lot of positive reviews and is popular on Amazon. We think it is a great beginners light when you’re looking for a cheap light to start your operations. This 300 watt LED grow light has everything you need. 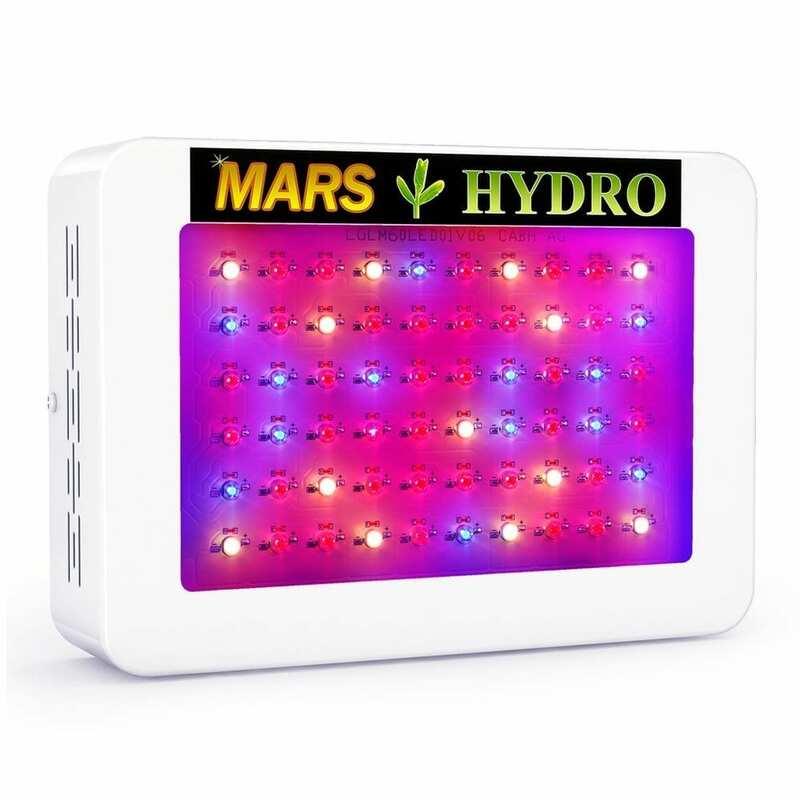 The Mars ECO 300 is the final addition to our family of the best 300w LED grow light reviews. This light has a great coverage area on different height while only consuming 100w. It has 2.5×2.5 feet coverage at 24’’. 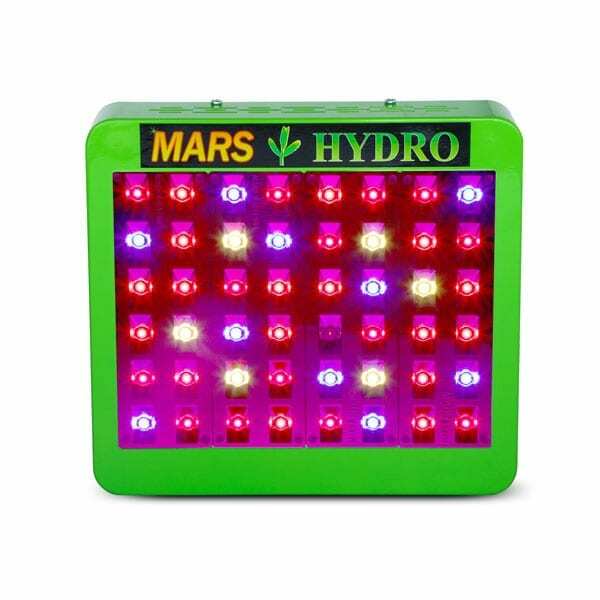 The difference with the original Mars Hydro 300w is that this has more red lights and lower power draw. Other good features are its safe design of the aluminum radiator system and the heat sink. The light runs cool and provides a nice spectrum. The reflective design provides a good focus on your plants. The full range of spectrum gives a good absorbance of light on plants. This spectrum is slightly more red than the original Mars Hydro 300w. Moreover, the 30 days money back guarantee and 3 years of warranty guarantee the quality of the 300w LED grow light. The CE and RoHS certifications make it a safe choice for your grow room. This light has super low power draw and good coverage. The ratio of power draw/coverage is one of the best in the list. Also, it is an affordable light for beginning growers. It has all the features you need and the full spectrum is good for all the growth phases. Check this video of the best 300w LED grow lights from 2017. Some of the lights still lead the industry after years! After reading all the details of different and the best 300w LED grow light, you know that it is hard to recommend a certain light. It is important that you know what is important for you. Is it flexibility in spectrum, safety, price or quality? You will find different spectrums, coverage areas and features with every light. Keep in mind that more expensive is often better quality when it comes to 300w LED grow lights. If we have to recommend certain lights, than the Viparspectra 300w and Advanced Platinum LED P300 are really worth looking at. Both are in a different price range and both have their important qualities. Combined with decent warranty and good experiences from many growers, these are the most important lights in the list. Keep in mind, your needs determine which light is the right 300w LED grow light for you. Also check out our article with the best 600w LED grow light reviews. We cover the best lights on this website. We even reviewed the latest COB LED grow lights. Looking for tools? Carbon filters come in really handy, just as fertilizers and nutrients for your plants. We reviewed the best 300w LED grow lights available on the market. Find the light that fits your needs. We provided options in every segment of the 300w market.